Slinfold captain Jonathan Hughes felt that their six-wicket defeat away at Goring epitomised their stuttering start to the season in Division 3 West. The Lyons Road outfit have won just once from seven attempts so far this season and remain third-from bottom in the table, a position above the relegation places. At the weekend, they opted to bat after winning the toss, but Hughes was again disappointed with their display as they managed just 126 in 32.4 overs. Hughes made 41 when opening the batting, but only he, Sean Overton (44) and Harrison Webb (13) made double figures. The captain was, however, as he has been in recent weeks, pleased enough with their display in the field, despite Goring coming home with 127-4 inside of 30 overs. Kellon Carmichael led the way with 55 adding to Sam Thorns’ earlier 33. Hughes said: “We won the toss and elected to bat on what was a good looking pitch. There was something in it for the bowlers but if you applied yourself then runs could be scored. “We backed ourselves to score 200 and to create some scoreboard pressure for the second innings. Unfortunately, we weren’t able to do that with only myself and Sean Overton making any decent contributions to the score. The Goring bowlers bowled tidily enough with Matt Keen taking 4-43 and Aaron Wyatt taking 3-16. “As is always the case the effort we show in field cannot be faulted, as demonstrated by the Mushal Murad, who, when diving for the ball, managed to split open his chin which required five stitches. This also meant we had to field with only 10 men for the majority of the second innings. “Our opening bowlers, Kemar Small and Mubbassar Hussain started really well. Mubbassar regularly beat the bat and was very unlucky not to pick up any wickets in his 10 overs which only went for 25 runs. 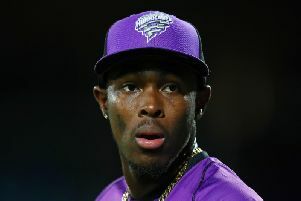 “It was a similar story for Kemar who on another day could have walked away with eight wickets and a man of the match performance given the numerous occasions he beat the bat during his 14 overs which only yielded three wickets. Slinfold travel the Three Bridges 2nd on Saturday.